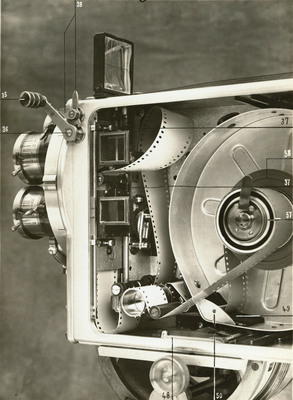 The Eclair Camera, tripod and lens, manufactured by Cinema Éclair, 12 Rue Greillan, Paris, ca. 1930. Camera open, showing route of film. The camera had six lenses, which could be used as six different lenses, or in pairs, one for viewing and one for taking photos.